Angel of Eden is Artension guitarist Roger Stafffelbach's new band project. Having recorded seven albums with the prog metallers Roger has formed his own band in his own vision with the focus on top quality metal with neo-classical influences. The result is The End Of Never - ten tracks of melodic harmonies, neo-classical lead work, potent riffs and grinding heavy metal rhythms all wrapped in a powerful production with superb artwork. Fuelled by Roger's virtuoso guitar work, the melodic soaring vocals of Carsten Lizard Schulz [Evidence One, ex Domain], keyboard wizardry of Mistheria [solo, Bruce Dickinson] and, the powerhouse drumming of Rami Ali [Evidence One] The End Of Never is a first class album from some of metal most respected names offering lush vocal melodies, pulsating rhythms and virtuoso lead breaks within captivating songs. 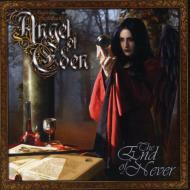 The album is also home to several notable guest performances in the guise of bassist Steve Di Giorgio [ex Testament] John West [ex Royal Hunt], David Shankle [ex Manowar] and Ferdy Doernberg [Axel Rudi Pell], The End Of Never is the start of Roger Staffelbach setting out with his own vision, more accessible than his work in Artension yet with the all the trademarks his playing is renowned for backed up with the ever impressive vocals of Carsten Schulz.. Angel of Eden - The End Of Never showcases an impressive new beginning from Staffelbach and a band that is ready to expand on this blistering debut.